The zombie invasion is headed to Los Angeles! Meltdown Comics & Collectibles, in association with UCLA Department of French & Francophone studies, Institut Francais, L.A. French Culture and more, will gather for VIS-À-VIS, an event bringing together authors and creators from France and the US, sharing their experience on adapting graphic novels to the screen. Americans Trevor Alixopulos (The Hot Breath of War), John Pham (Sublife), Edward Gauvin (Translator, The Conductor and Other Tales) and Dan Panosian who has worked with all the major comic book publishers will meet with French creators Jul (Silex and the City),Abel Lanzac (Weapons of Mass Diplomacy), Fabien Vehlmann (Green Manor, Seuls) and NBM’s very own Arthur de Pins, of Zombillenium. This is the first time France’s new generation of comic creators will visit Los Angeles. The eight French and American creators will discuss their art and practice. Vis-à-Vis: French Bande Dessinee Meets L.A. Comics will be held at Meltdown, 7522 Sunset Blvd, Los Angeles on Sunday, November 9th at 2pm. 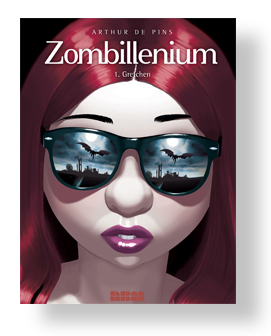 For more information, follow Meltdown’s blog and be sure to read up on Zombillenium beforehand! To RSVP to this free event, follow this link! Next Next post: Coming Up From NBM Publishing! Dungeon, Zombillenium, Geary and More!